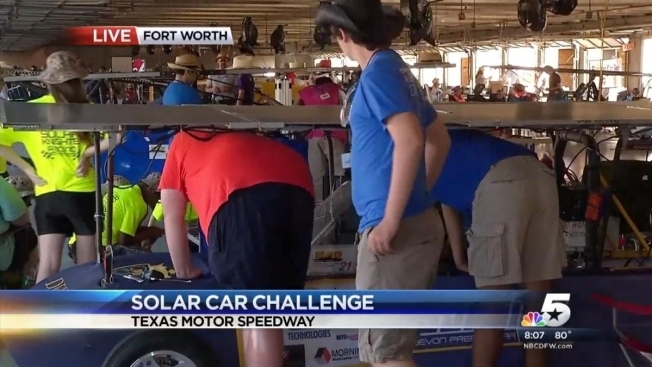 NBC 5 and the Solar Car Challenge Foundation invite you to the 2015 Solar Car Challenge July 20 through 23 at Texas Motor Speedway. Come share the fun, meet the kids and see their solar cars. The Solar Car Challenge is a closed-track event held at the world famous Texas Motor Speedway that helps to motivate students in Science, Engineering, and Alternative Energy. We teach high school students around the country how to plan, design, engineer, build, race, and evaluate roadworthy solar cars. There are 151 on-going high school solar car projects in 29 states, Mexico, Puerto Rico, Costa Rica and Uzbekistan. There are more than 400 schools lined up to enter this project in the future. 31 of these teams have announced that they are going to race in this summer’s race at the Texas Motor Speedway. The Solar Car Challenge was established in 1993 to help motivate students in science and engineering, and to increase alternative energy awareness. The challenge teaches high school students around the world how to build roadworthy solar cars. Each team’s solar car is an individual project; they are not provided a kit. Students learn to choose materials for their solar car based on their plan, financial resources, and capabilities. This helps makes the Solar Car Challenge a unique “turn key” project. The Solar Education Program provides a safe environment for teams to display their solar cars. On alternating years, they share the fun of the world-famous Texas Motor Speedway or drive cross-country to share their projects with millions of people. For more information, visit http://www.solarcarchallenge.org.